“The justification that the inspectors could not enter because the community is run by the militia is wrong," says CREA-RJ official. BRASILIA, BRAZIL – As more than 100 firefighters and civil defense agents race against time to find survivors trapped in rubble of two buildings which collapsed on Friday in the Muzema favela community, in the Western region of Rio de Janeiro, officials try to justify the lack of control over construction in the area. Engineers, however, say that the reasons for the lack of monitoring is weak. 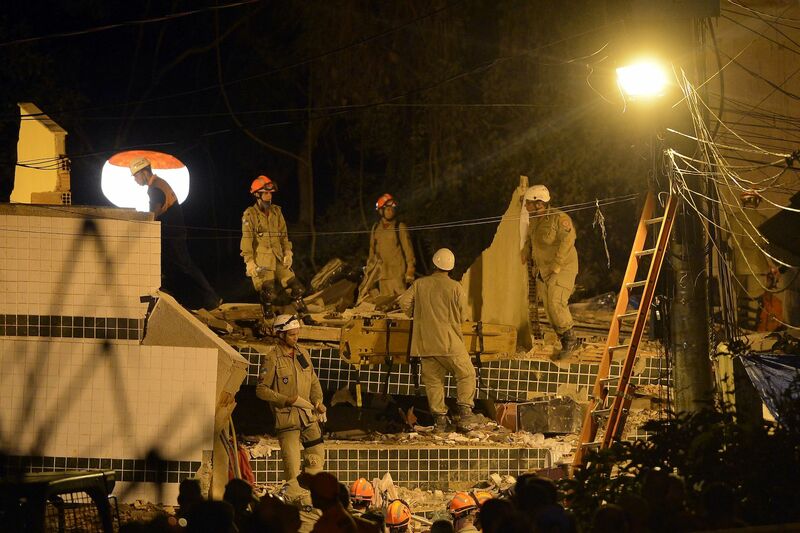 Firefighters work through a second night on Saturday, looking for survivors of Friday’s building collapse in Muzema, Rio, photo by Fernando Frazão/Agencia Brasil. “The justification that the inspectors could not enter because the community is run by the militia is wrong. What we cannot have is militia; the State is also negligent in that, because it has allowed these militia (groups) to exist,” said engineer Eduardo-König, vice-president of Crea-RJ (Regional Council of Engineering and Agronomy of Rio de Janeiro), during a press conference. The entity stated that the collapse of two buildings was due to the omission of the public power, which did not prevent the construction of irregular buildings nor did it render security for inspectors to work in the region. “Looking at aerial shots of the rescue, I saw more than 60 buildings in the area. Sixty buildings that should not be inhabited because they put residents at risk,” added Mattos, stating that a quick calculation would have at least 10,000 people living in buildings that are not safe in that community alone. Rio officials have evacuated three adjacent buildings for fear they too might collapse. Rescuers have been working non-stop since Friday morning, when the two buildings collapsed. Rescue dogs and equipment specific for collapsed structures were brought in to try to look for survivors and bodies under the concrete slabs. As of Sunday morning nine people had been killed in the collapse and fifteen were still missing.